A nuclear power plant accident in Chernobyl, in 1986, is still causing serious environmental problems which worry Ukrainian people. Today we don’t have enough drinking water supplies because of that accident. This is a multilevel (A2+) sixth grade group of twenty-five twelve year old students. They were not even born when the Chernobyl accident happened, yet these two sentences provoked a series of questions on the what, why and how of the event. This interest made me think it would be worthwhile to elaborate a bit more on the accident. I framed it as a small project and drew on the KWL (Know-Want to know-Learned) strategy to set it up. KWL (Ogle, 1986) is a reading strategy that helps guide students through a text. Students first brainstorm everything they know about a topic, then they generate a list of questions about what they want to know. After reading, they record what new information they have learned. It serves to activate background knowledge, sets a purpose for reading, and helps students monitor their comprehension. KWL is constructivist in nature. This means it asks learners to get involved in constructing meaning and knowledge. In our case I modified the strategy to: Know-Ask-Explore-Learn. Step Inside: perceive-believe-care about is a routine that can work effectively towards appreciation of the other’s perspective. It asks students to step inside a character and deepen their understanding. Perspective often shapes the way things are understood, so this focus on perspective appreciation can lead to a deeper awareness and help stimulate empathy. Show students a work of art, a photograph, a video. The source material may also be a story or a poem the class has read. When working on issues of social justice and fairness, choice of material that can evoke an emotional response and lead to more creative understanding is of importance. It might also be material that involves some sort of dilemma calling for multiple perspectives to be considered. What might you care about? Perceive here can be replaced by see, observe or understand. Likewise, believe can be replaced by know or think. It is interesting to note the use of might in the second and third question. Might sends the message to students that the idea is not to come up with a single answer, but to think broadly about alternatives. Using conditional language signifies our attempt to understand someone else’s perspective through hypothesis making and raising possibilities. Students can work individually, in pairs or in groups. They can first take notes of their responses before sharing them with the rest of the class. Share the thinking and ideas. If students have worked individually you may consider placing them in groups where each member has chosen a different perspective. Another idea would be that students who have chosen the same perspective are grouped together and compare their responses. In this case I had asked students to Step Inside the character of the boy in the middle of the painting. It would be more complete and interesting in terms of understanding perspectives around bullying to have them also consider the viewpoint of the group of children who were bump bouncing him. I tried to bridge this gap with some follow up questions like: Why do you think the boys behave like that? or why do you think they punish him? You can also read about this routine in Chapter 4 of the British Council’s new book ‘Creativity in the English language classroom’ (Edited by Alan Maley and Nik Peachey). It is a collaborative publication comprising of 18 chapters, each with a blend of theory and practical activities. The pdf can be found free to download here. Among the contributors there are many members of the C Group, an initiative that brings together a collection of people and a cluster of ideas sharing the belief for reinforced creativity in ELT through collective action. Ritchhart, R, Church, M and Morrison, K (2011) Making Thinking Visible: How to Promote Engagement, Understanding, and Independence for All Learners. San Francisco: Jossey-Bass. pp. 178-184. Description: This proposal is organized around the theme of deforestation through the use of 3 paintings by Vincent van Gogh, Constable and Seurat and Shel Silverstein’s The Giving Tree and a short motion graphic video by Sasha Milic, a Norwegian designer, animator and illustrator. The thinking routines used are: Step Inside: Perceive-Believe-Care About, Sentence-Phrase-Word and Now-Then-Later. Show students the paintings below and ask them what they have in common. Elicit that all three of them have trees. Tell them that Edinburgh University’s Iain Woodhouse, who maps forests using satellites, photo-shopped the trees out of these famous paintings to show the aesthetic value they have and to draw attention to the threat of global deforestation. Show them the photo-shopped paintings. Work as a whole class and brainstorm your students around ways trees can be useful to people. Write on the board: The Giving Tree. Tell your students that they are going to watch a video based on a book by an English author, Shel Silverstein with this title. Ask them what they think the book is about. Show the video. Ask your students: how did the story make you feel? Show students the slide share presentation below and ask individual students to read the text in the slides. Ask students to step inside the narrative and imagine they are the tree or the boy. From their chosen point of view they should first write down and then speak about what they might perceive-believe-care about. Go around the class and help with vocabulary if needed. Allow 15 minutes and get feedback. As individual students speak from their perspective, the rest of the class could guess which perspective they are speaking from. Keep a visible record of students’ different perspectives and viewpoints. Hand out the video transcript and ask them to read the story again. While reading ask them to choose: a) a sentence that was meaningful to them, that they feel captures a big idea of the text b) a phrase that moved or engaged them and c) a word that captured their attention or struck them as powerful. Allow 15 minutes and get feedback. Tell students that they are going to watch a short motion graphic video which is an effort to improve environmental awareness about deforestation in Indonesia, one of the countries with the highest rate of deforestation, caused by paper industry. Show the video. The Forest from Sasha Milic on Vimeo. Ask them to write down the effects of deforestation (reduced biodiversity/wildlife deprived of habitat, release of greenhouse gas emissions, global warming, climate change). Write on the board: Deforestation-let’s make it fair: Now-Then-Later. Ask students to brainstorm ideas for things they might do to “make it fair”. Sort the list into actions that relate to making the situation fair in the past, now, or for the future. As students talk, record their ideas on the board or on chart paper. Ask students to choose one idea from the list they feel is most important and expand on it verbally, in writing or explore it creatively (drawings/collages/poems). I hope you find this proposal worth experimenting with. Art Least is a site created by Chrysa Papalazarou, an English teacher from Greece. Chrysa works in a state primary school. She has previously worked in secondary education amd as an adult instructor in a Second Chance School. 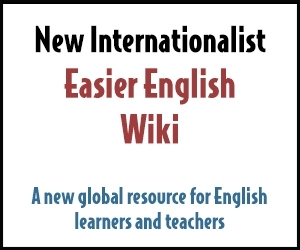 This site explores ways of using art in English language teaching and learning, and promoting a more thoughtful and creative flow in the English classroom. Thank you for visiting.